What is the Bridge Street Centre? 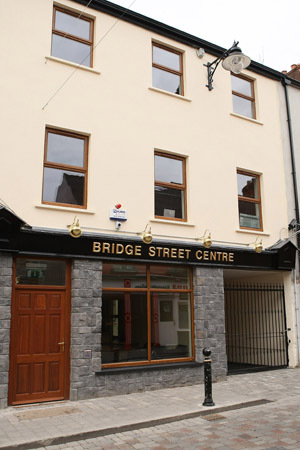 The Bridge Street Centre is a community resource facility which is located in Cavan Town and is available for use by local resident associations, family support, community and youth groups in Co. Cavan. The Centre is a three storey building which is owned by Cavan County Council. The Bridge Street Centre was developed as a flagship project under the RAPID Programme following a consultation process with local community and the Cavan Town RAPID Area Implementation Team. This interagency group supported by Cavan County Development Board and Elected Members of Cavan Town Council spearheaded the establishment of this multipurpose facility that caters for all ages in a central location to serve the needs of the local community. The Bridge Street Centre was officially opened on the 3rd of April, 2009. Services include counselling, provision of meeting rooms for community groups, organisations and outreach services. Who uses the Bridge Street Centre? There are a number of service users operating from the centre including; Breffni Community Employment, YAP, Cavan Supported Employment, Tearmann Domestic Violence Services, Mediation Border Counties and the Cavan Traveller Movement. Further information on the service users is available in the About section of the website. A sample of groups who use the Centre for training and service provision include; Health Services Executive, Cavan County Childcare Committee, Cavan-Monaghan ETB, Cavan Adult Learning Centre, Solas Nua, Cavan Sports Partnership, Heartbreak to Healing, Cavan Community & Voluntary Forum, Cavan Chess Club, Cavan Social Inclusion Measures Group, Kesh Kids Parent And Toddler Group, Comhairle na Nog, Cavan Foroige Club, Cavan Town Women’s Group, Grow, Latch-On, RehabCare, National Learning Network, Tusla, Alzheimers Society, Cavan Dementia Community Network, LGBT in Cavan, Cuan Cancer Social Support & Wellness Group, Cavan Lithuanian School, and Breffni Integrated Ltd.